I don’t like “Monica’s” tee, the stripes look awkward. Your three, however, look great. 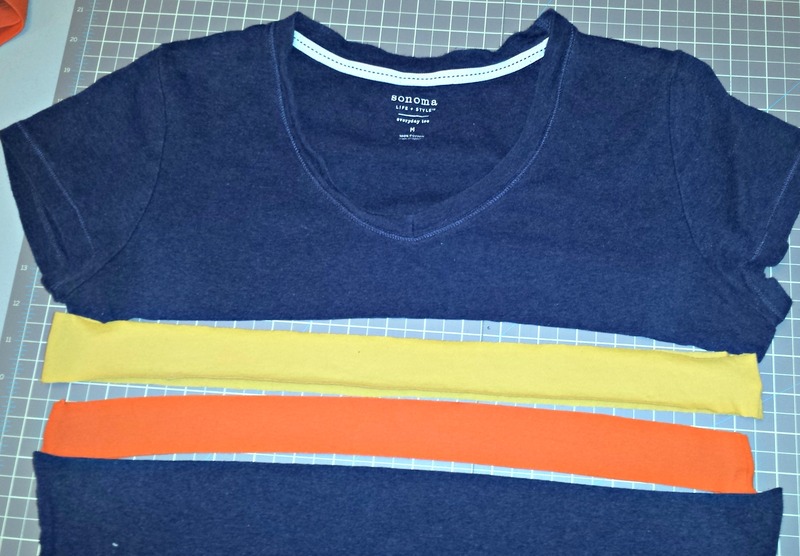 I like the thickness and positions of the stripes and the colors. Thanks for the inspiration! Why hello, Lindasblogs! If you end up making your own version, I’d love to see it. Figuring out how to combine the tees was my favorite part, as usual. For me, construction is the necessity that allows me to get to play with design. Thanks for commenting! This is a great idea and well executed. But do you know what I am really taking away from this? It’s the term “sewist”. I have sewed almost my whole life but the term “Sewer” obviously denotes something else and is not likely to be pronounced “So – er”. But “Sewist” works. Did you coin the phrase? Or is it just me who never heard of it? I’ve debated myself about this term, too, Good Woman. Nothing ever sounds quite right. I’ve come across “sewist” a few times on other blogs, though it does seem relatively uncommon. Still, it suits my ear best, so I just go with it. I like your question! Clearly, we’re both wordists, too. Hee, hee. I like the term “sewist” and also “wordist”. Neither “sewer” or “worder” would work. On the other hand I must not be much of a grammarist (I guess that would be grammarian). Is it proper to say “Is it just I who never heard of it” or “Is it just me who never heard of it”? I believe I misspoke. Ha, Good Woman, it’s so funny that you’re asking me grammar questions. Believe it or not, I used to edit grammar textbooks for a living. I was a member of the GUM team (grammar, usage, mechanics). I’ve always loved words–their structure, their sound, and especially their power. That said, it was YEARS ago and I’m a little rusty. I *think* “It is I” is the way to go, even though it sounds weird. I was a teacher 30 years ago and I knew all the grammar rules. Clearly as the years passed I have forgotten much of it. I didn’t realize my error until I went back to reply to your first comment. Thank you. One of my favorite parts about writing in a conversational style is that I don’t have to strictly follow all the rules anyway. See, I can split those infinitives with abandon, ha ha. Also, go teachers!! I am with re: go teachers. Their jobs are getting harder and harder I think. I can’t really lose the teacher thing with grammar even though I don’t remember a lot of the rules. Hey, thanks, Melissa! Once I got started with this, there were so many possibilities my head was exploding. 🙂 Putting the colors together was great fun.